How to Become a Forensic Scientist in Florida? How much does a Forensic Scientist Make in Florida? Do you enjoy solving problems and puzzles? Are you good with communicating and putting difficult concepts into simple words? If your answer to these questions was yes, a career in forensic science just might be the thing for you. Working in this field would involve collection and analysis of evidence relating to complex crimes, such as sexual offenses, robberies, homicides and even fraudulent practices. The evidence collected is then analyzed in great detail to determine the sequence of events to attempt to solve the crime. 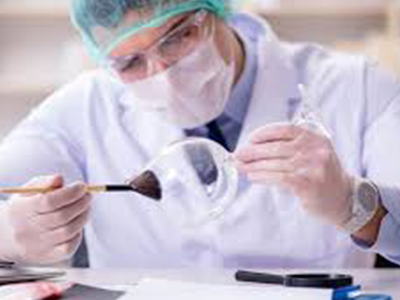 Forensic Scientists typically work in two parts – crime scene investigation or laboratory analysis. They collect evidence such as weapons, bullets and other substances found on the scene. They also collect blood samples, clothing or other materials, fingerprints, footprints, etc. In addition to that, they take detailed photographs of the crime scene for further analysis. All this evidence is then analyzed in the labs to recreate a crime scene. The work schedule of a forensic scientist can be quite erratic, often working at odd times, including evenings and night shifts. Working overtime is a standard in most cases, as they are required to collect evidence from new crime scenes whenever and wherever it happens. Forensic Scientists who work exclusively in laboratories however, usually have a very regular work week. Nonetheless, there are occasions when they have to stay back if evidence needs to be processed immediately. The work of forensic scientists puts them at a risk of exposure to various infectious agents, such as foul odors or poisonous fumes. For this reason, they are usually required to wear protective clothing and take protective measures. With a job as technical as this, it is evident that becoming a forensic scientist would require a solid education and training. If you are interested in becoming a forensic scientist in Florida, the following information would be of great help to you. Since the field of forensic science is a highly technical one, the minimum education required for most entry level positions is a bachelor’s degree. You may opt for a bachelor’s degree in biology, chemistry, forensic science or physical anthropology. Whatever degree you choose, make sure you take several forensic science courses. A 4-year bachelor’s degree in forensic science would likely include coursework in areas such as organic chemistry, inorganic chemistry, microbiology and genetics. Though this is not a requirement for the entry level jobs, many advance level jobs might require you to have a master’s degree or even a P.H.D. in some cases. You may go for further specialization in biology, anthropology or chemistry, enhancing your existing knowledge to an advanced level. Once you have met the educational requirements, you can start looking for a job. You can look for work in various law enforcement departments in the state of Florida, such as the Florida Department of Law Enforcement Crime Lab – Tampa Bay, St. Petersburg Forensics, Orange County Medical Examiner’s Office, Federal Bureau of Investigation – Miami Division, Jacksonville Sheriff’s Office Crime Scene Unit and so on. You can look for job opportunities at the county, state and federal levels – Florida has plenty of opportunities at each level. Once you get a job, most employers would require you to complete on-the-job training. This would be designed to give you a detailed overview of how things are done at your new workplace. It would typically include your employer telling you about the proper procedures for collecting and analyzing evidence, along with the documentation procedures. The entire program can last anywhere from a few weeks to one year, depending about the nature of your new job. You might also be needed to pass a proficiency exam before you are assigned to work on cases independently. If you are looking for advancement options, you might want to consider getting a certification. Getting additional credentials, besides the basic education, experience and training would serve as a stepping stone in the forensic science career field. Various organizations offer certificate programs in Florida. For instance, you can get certifications from The American Board of Criminalistics or The International Association for Identification. Various universities also offer graduate level certificates for forensic scientists in Florida. According to 2017 data from the US Bureau of Labor Statistics, Forensic Scientists in Florida made an annual mean income of $50,620. This is relatively lower than the $61,220 national average. The job growth figures for forensic scientists in Florida are very encouraging though. Between the years 2016 and 2026, the jobs for forensic scientists are expected to grow by 22%, a growth rate much higher than the 17% for the US. 230 new jobs are expected to be added in this time period, which is higher than a lot of other states.